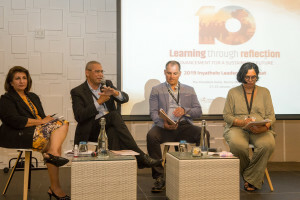 The moderator was Inyathelo trustee Zenariah Barends, joined by panelists Rooksana Rajab – Director, Resonance; Lorenzo Davids – Chief Executive Officer, Community Chest; and James Kydd ‒ Director DevMan. James pointed out that technology can jumpstart fundraising and grantmaking. Traditionally there has been a correlation between an institution’s grantmaking staff and the amount the institution can raise. Technology can help to overcome this limitation. In general, one needs to invite a few hundred thousand alumni to convert to a few hundred donors. Technology and automation are a powerful catalyst in this. An audience member commented that the prospect of universal free education is giving many donors in higher education pause as they wonder whether their donations are necessary or perhaps better used elsewhere. Another commented that this is causing some donors to shift their focus from fees to other matters such as accommodation and preparing students for work.